Napoli president Aurelio De Laurentiis confirmed the Italian side rejected a £95million offer for reported Manchester United target Kalidou Koulibaly. 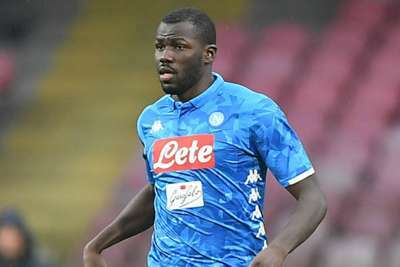 Star centre-back Koulibaly has been linked with Premier League strugglers United amid reports the Red Devils had a £91m bid turned down by Napoli ahead of the January transfer window. Discussing Koulibaly's future, De Laurentiis told reporters: "We are more than capable of developing top players and keeping them too. "When they offer £95m for a centre-back, that is a figure that has never been offered before, it means this is a top player." Koulibaly has established himself as one of the best defenders in the world since joining Napoli from Genk in 2014. The 27-year-old Senegal international – who has made more than 150 appearances in all competitions for Napoli – has featured in all 16 Serie A games this season, with the club second behind Juventus. "When we had Gonzalo Higuain who scored all those goals with Rafa Benitez and [Maurizio] Sarri, even though he missed some penalties and skipped the Champions League for a season, we had top players," De Laurentiis said. "When I hear lies like 'there are no top players at Napoli,' it drives me crazy. Was Edinson Cavani not a top player? Signing a second striker like Dries Mertens into a centre-forward who scores 30 goals, getting a talent like Arkadiusz Milik who had two serious injuries and still performs at the highest level… it means we Neapolitans like to complain."